Johanna is researching cellular interactions within the breast tumor micro-environment at both primary and metastatic sites. Using tissue engineering, molecular imaging, and computer modeling tools to analyze cellular metabolism, EMT, and signaling, she hopes to reduce patient metastases by exploiting the cancer/stromal cell relationship. 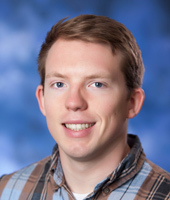 Patrick Kinnunen is a PhD Candidate in Chemical Engineering, Co-mentored by the Luker lab, his Primary Mentor is Jennifer Linderman. Phil Spinosa is a PhD Candidate in Chemical Engineering, Co-mentored by the Luker lab, his Primary Mentor is Jennifer Linderman. Anne Gibbons BS 2015, Environmental Science.